A man who was arrested on suspicion of murdering a Pakistani politician in London has been released on bail. 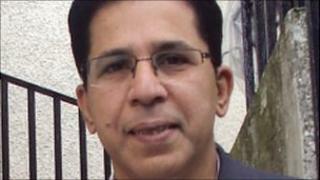 Dr Imran Farooq, 50, a senior member of the MQM party who had been in London since 1999, was stabbed in Green Lane in Edgware on 16 September. A 34-year-old man who was arrested in Camden, north London, on Thursday has been bailed to report to police in January. The man was also quizzed over a robbery a month after the murder. Police, who had issued an e-fit of a suspect, said they still wanted to speak to two other men in connection with the fatal attack. Following the murder, Raza Haroon, a member of the MQM central committee, said Dr Farooq - who was living in exile in London - had sought asylum in the UK as he was under "threat". He left Pakistan when the government launched a "clean-up" led by security forces, following allegations the MQM used strong-arm tactics against opponents. Tens of thousands of mourners attended Dr Farooq's funeral held in Karachi in November. He was married with two sons.